We promote a variety of match types: NRA Action, ISA Steel, and IPSC. 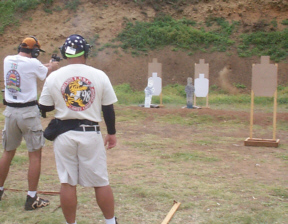 The match type we emphasize is the IPSC match; a format that tests the shooter's ability to solve practical shooting problems. Times are quick and the targets are placed at various distances. Shotguns and rifles are also shot as special sidematches every other month. Matches are usually held on the first Sunday and third Saturday of the month. Annual membership fee is $55 with a $25 discount for NRA members.